Blasting off to you with programs to take you out of this world! All programs can serve up to 30 children at one session. They are designed for children in K-4th grades, but all but the Astronaut Adventure can be adjusted to appeal to children up through middle school. Become a NASA astronaut by going through official training! Make your way through various stations to learn how to walk on the moon, eat like an astronaut, and much more. After completing the training each child earns their own NASA badge to become an official astronaut. 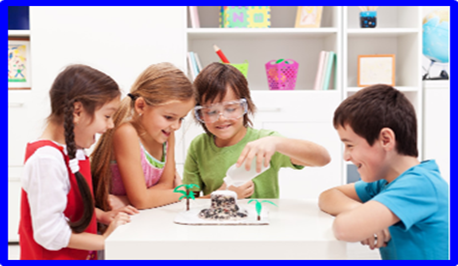 This program will appeal most to children K-2nd grade, though is appropriate for children up through 4th grade. 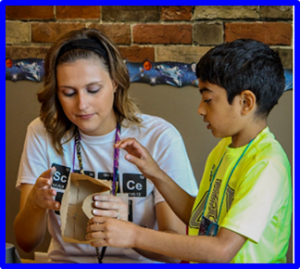 Design and create your own lunar explorer to send to the moon. Using the engineering design process then test the design to see if it can make a safe landing. Pair this with Soaring through Space for an additional engineering challenge. Get ready to soar! 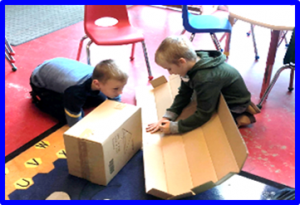 Using cardboard, special tools and other recycle materials construct a spaceship that can fly through outer space. Add special gadgets and tools to your ship to make your space trip out of this world. Pair this with Lunar Lander Launch for an additional engineering challenge. The outer surfaces of solid planets are shaped by geologic forces similar to Earth’s. Experiment with these forces by modeling volcanoes, glaciers, impact cratering, and erosion. 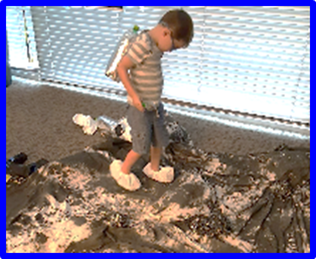 Sometimes science gets messy! Contact Education Department at 812-235-5548 or education@terrehautechildrensmuseum.com or use the online reservation form.